Helping families at home in the Sussex & Borders area since 2005. The first personal UK service of this kind. Dr. Suzen Gregersen, MRCVS hospice and emergency vet and her caring Vets2Home team, offer end-of-life care for all your pet's needs. Helping them to stay at home - without stress and worry - towards the end and hereby making this special time as joyful as possible while lasting for as long as possible, even if just for a few days, weeks or months. End-of-life/Palliative/Hospice Care compassionately bridges the time between the point when sadly there is no cure for your pet's ailments or you decide to no longer pursue a cure and to the moment your pet is ready to pass on. It is a brave step to take when you bring a beloved pet home knowing there is no cure to give them. 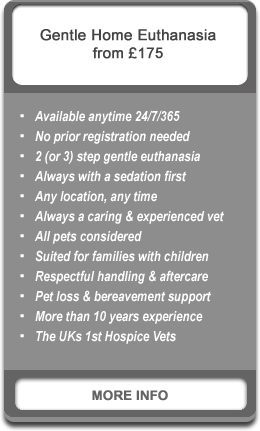 This may seem overwhelming and scary but rest assured, the Vets2Home's Palliative Care & Hospice Team, are there to guide you, comfort you and help your pet by offering professional veterinary support through the whole journey - until the time of the blessed gift of euthanasia - or much more rarely - even a hospice-assisted, natural death. Their experienced Hospice Vet, Dr. Suzen Gregersen, MRCVS and her caring team will take good care of your special pet - and you - in your own home. Rest assured they are here 24/7 to help you enjoy your life together - for as long as possible. Their emergency duty vet is also available to come out and examine and treat your pet after normal practice hours (Out-Of-Hours). They always carry a wide choice of injectable medicines for most urgent medical ailments and health problems that do not require immediate attention at an emergency clinic. • Calm, unhurried professional home vet examinations and advice with a wide range of injectable medication. • Plenty of time for difficult decisions in the comfort of your own home. 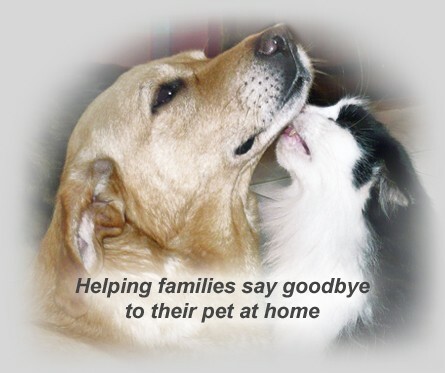 They will make tailored home care/hospice plans to match your pet's (and your own) personal and special needs, for a guaranteed gentle, peaceful and pain-free transition and goodbye. 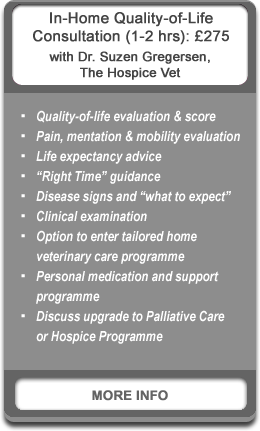 They provide professional, end-of-life advice and support for all those difficult questions, by phone, email, text and offer home consultations at all times. All prices correct Jan2018 and are for non-urgent appointments booked in advance. 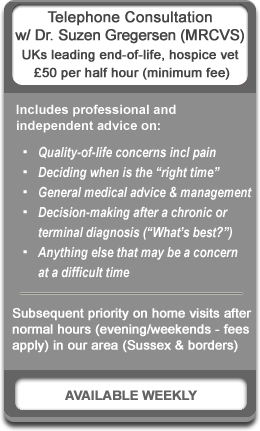 All in-home consultations are available 24/7 but may incur an urgency/out-of-hours fee. Cancellation policy: A credit card may be required to reserve any appointment time. The card is not charged until the appointment. Appointments cancelled within 60 minutes of the scheduled arrival time may incur a £100 cancellation fee. Our beloved unwell cat became very week overnight and we knew her time had come. 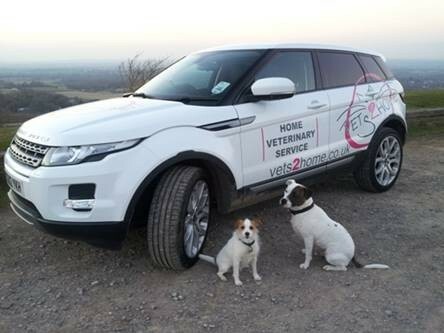 I contacted vets2home in hassocks and requested an urgent same day visit. Suzen attended and showed great compassion and kindness to both us and PK. PK was given a sedative and while holding her and stroking her, she gently and peacefully went to sleep. Suzen had made a heartrending time more bearable. I would highly recommend vets 2home and would recommend to every pet owner that when the time comes, use a home visit to avoid your pets stress. I would just like to thank Susan for her extraordinary care and support during a difficult time letting go of our beloved dog Jasmine. I cannot recommend Susan at Vets2Home highly enough. She was absolutely fantastic throughout, from the palliative care the night before through to the next day when it was time to say goodbye. She was also wonderfully compassionate towards my Mum who was heartbroken by the loss of her little best friend and our Jasmine was able to pass peacefully at home surrounded by the people she loved and who loved her so much. Susan also arranged for Jasmine's cremation and looked after her at her home for the few days until that time, which put our minds at rest to know that even after death she was still being cared for respectfully. I wouldn't hesitate to recommend Vets2Home to anyone. We would highly recommend this service. The vet who came out was wonderful with both us and our beloved dog Jess. Jess was able to die in her bed in her own home with us cuddling her. It was a very painful for us to lose our beloved dog after 15 years but we both felt she had a peaceful and pain free death. We also felt very supported in making what is always a very difficult decision and that it was the right time. We would highly recommend this company. I am sorry I can't remember the name of the lovely vet who came out. She didn't rush us and was very kind and gentle with Jess. I was so distressed about trying let my faithful Springer Spaniel Spangle go . I was recommended Vets2 home by my Friend . I'm very greatful that she did . The vet was so kind and professional. My lovely Spangle just went to sleep in front of the fire in her usual spot no distress on her part . Peaceful,quiet ,and dignified. My daughter and I would highly recommend this to be the only way to let you loved and faithful dog or cat go in their own home among their family . Superb service at a very difficult time. Kindness and compassion. Recommended if you ever find yourself in this awful situation. The perfect people to help your pet and you through this sad time. My beloved dog Jo left us peacefully and without stress, for such a hard time, it was the best it could be. I will be for ever grateful. We were so grateful to Susan who is very caring. Our cat Alfie died peacefully in my arms at home. We highly recommend this service.